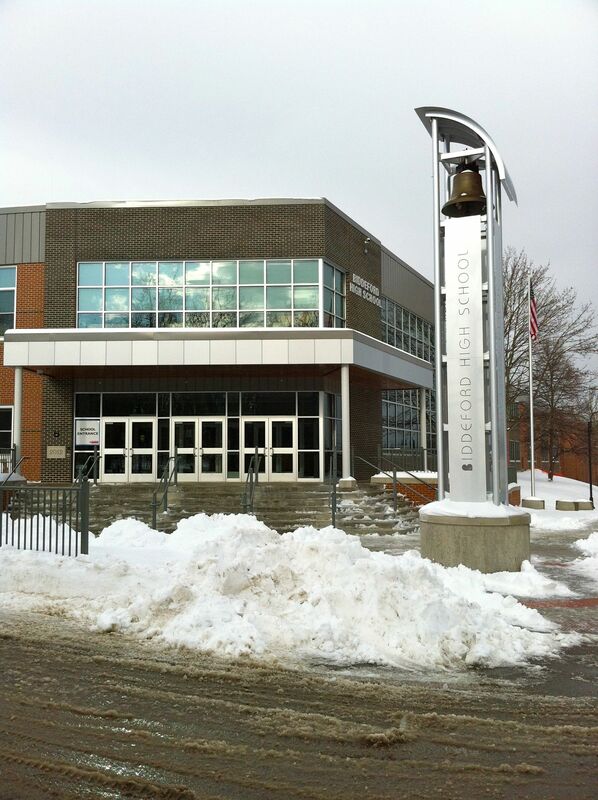 $34 million and two years – that’s how much it is going to cost and how long it should take to finish the renovations at Biddeford High School. Construction began in June 2010 and now more than one year later, “we are almost 80 percent complete … and coming in slightly under budget,” said Principal Brit Wolfe. He didn’t have the final figures, but Wolfe said the poor economy might have actually helped keep renovation costs down. “Contractors were really looking for work,” he said. Students and staff are now in the second half of the current school year and according to Wolfe, the school has never looked better. The school was built in 1961 and last renovated in 1971. Forty years later, construction is taking place on Maplewood Avenue again, this time from the ground up. According to city’s website, in November 2009, the citizens of Biddeford approved a $34 million bond for the construction, and without any support from the state or federal government, the project was set to begin during the summer of 2010. There is a significant cost for all of this. The bond that was approved requires the taxpayers to repay the $34 million over the next 25 years. At that time, the school will be 75-years-old. Wolfe said that at this time, all of the bond funds are earmarked for renovation and construction. None of these funds are dedicated for maintenance and upkeep. Wolfe explained that the cost for maintenance would come out of the current and future operational budgets for the school. Teachers and students have had to shift classrooms, athletic space and performance centers as Ledgewood Construction Co. rebuilds the facility. “The last of the moves will take place in April,” said Wolfe, and that point the final construction phases will begin. Once the final move takes place, contractors will start to disassemble and move the portable classrooms that now located on the school site and begin the final construction. Tiger Gym and the cafeteria spaces are two of the remaining section to be renovated. “Everything is supposed to be finished by August,” Wolfe said. As he walked through the school and talked about the construction, he said there are two areas of the school that have already become focal points for teachers and students. The new library space is being used as a media center and classroom space as well as a traditional library. “All of the classrooms now have ENO Boards,” he said. The new chalkboards allow the teacher to create a digital learning environment and post notes directly to their class websites. “The classrooms have all had audio enhancement as well,” Wolfe said. Students are able to access audio lectures and written notes from a class via the Internet. “It helps when a student is absent or just wants to refer back to the information,” he said. In addition, “every freshman takes a course in digital literacy and it is taught here,” Wolfe said, pointing to a new computer equipped classroom space. The library also has a new section that can be used for community meetings and events. Wolfe and his staff currently use it for leadership team meetings and other school functions. In addition to the new library space, a 350-seat auditorium has been built in the space next to the Tiger Gym. Wolfe said that depending on the audience size, future performances may be held at the high school, Biddeford City Theater, which has 550 seats, or the Performing Arts Center at the Biddeford Middle School, which can accommodate up to 950 people. Wolfe said that in February, students from the high school would perform in a theatrical production of Xanadu. It would be the first such event for the new space. Renovations are not limited to just classroom space and technology. The main entrance of the school has been completely changed, which Wolfe said is much more secure. “Like some schools, we used to have students that just came onto the campus,” he said. Teachers and staff had to recognize that they didn’t belong and then take appropriate action, he said. Now, cameras monitor the main entrance to the school and visitors must come through a locked foyer before they are admitted. The project also included upgrades to the school’s computers and internal network. Wolfe said that students in an English classroom may have part of their class in a traditional room and then use a writing lab filled with digital equipment. In addition, journalism students now work on the school newspaper using new state of the art computers, printers, and graphic design software in a dedicated space. A glass wall separates the classroom from the writing space. “The new space is just great,” said English teacher Dawn Pendergrass. While she was leading her class through an exercise other students quietly worked on the school newspaper in the adjacent room. She just smiled at both groups of students. As part of the project, designers and planners also focused on the outside of the school. The victory bell marks the entry into the school and there is ample space for students and staff to go outside in the new central courtyard. Wolfe said he knows that what the teachers, students, and staff now have is special and to be treasured and maintained. His face and expression lights up when he talks about the changes.